Sitting in Spain at the beginning of the year, we started contemplating the next chapter in our Motoroaming adventures – our Greek Odyssey. How best to get there? Did we go overland and take two weeks to get there with the investment of diesel, wear and tear on the van and campsite fees or use the ferries, via Italy? A conundrum indeed. Even after a year on the road, we still feel like we’re building our confidence and we have plenty of green tendencies in our nomadic life. 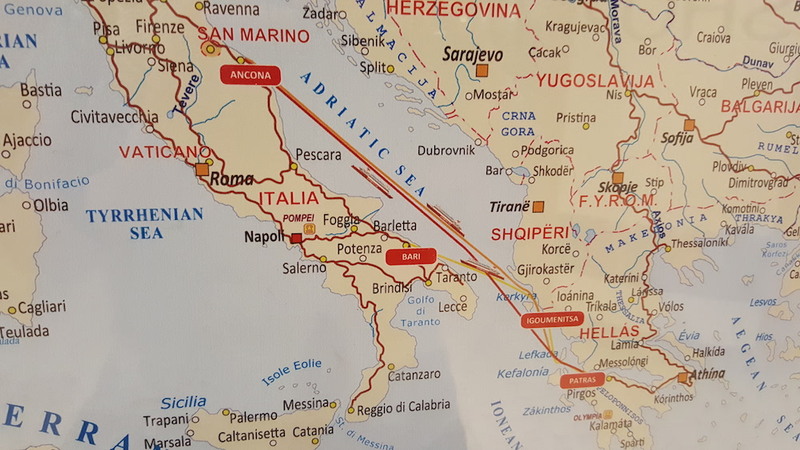 So the thought of travelling through Albania and Bosnia didn’t greet us with huge joy, especially given that our insurance wouldn’t cover us in those countries and we would need to reply on buying insurance at the Borders. At this stage on our trip, we decided that going by ferry was the right option for us just now. So we have documented our route, costs, camping spots and experiences so that if you have the same contemplation any day soon, this may help your planning. 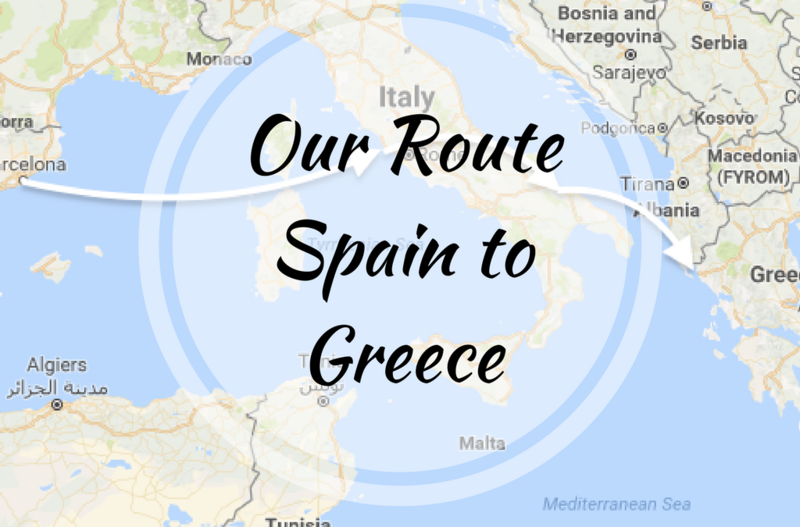 After three months over winter in Spain, we wanted to get to Greece for springtime, given that the summers would most likely be too hot for us (read me – Myles was born in Cyprus so he’s a sun-baby). So leaving end of March or beginning of April gave the weather enough time to warm up and yet not fry us to a crisp. 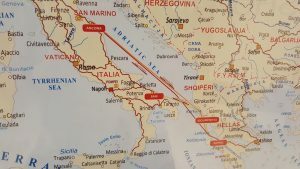 We decided to go from Barcelona to Italy, then cross the country to Bari, then catch a second sailing to Igoumenitsa, just south of the Albania border. Barcelona offers two ferry operators; Grimaldi Lines who go to Savona and Civitavecchia and GNV to Genoa. Barcelona is such a great option as before you sail, you could fit in a quick city tour, a visit to Monserrat up in the mountains and Sitges to the south has to be on the cards. Here’s our Guide to Barcelona, without Blisters to help make the most of your visit here. 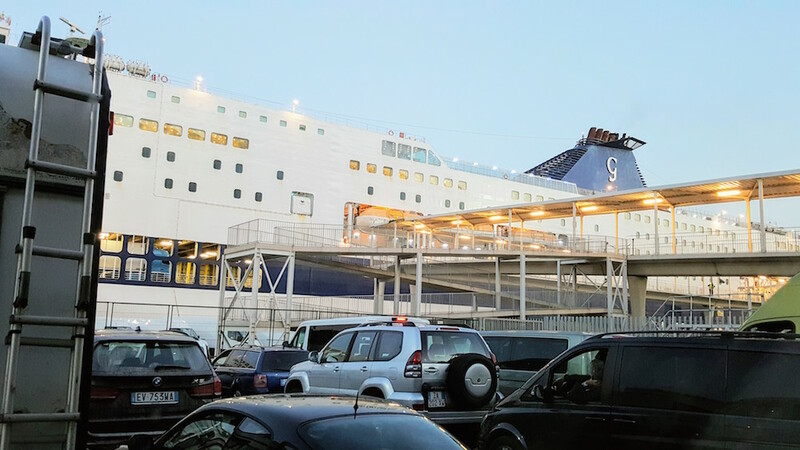 We took the Civitavecchia route so we would arrive on Italy’s west coast – just north of Rome. Genoa or Savona are cheaper, although after nine weeks in Italy in 2016, we decided to short-circuit the Italian leg and save the bone-rattling ride. Such is our eagerness to begin our Greek experience. Sadly Grimaldi lives up to its name and it aptly describes both their ferry and service. We booked through Direct Ferries to get the best price, which was €410, far cheaper than with Grimaldi direct. It is no cruise liner that’s for sure. Sailings leave Barcelona at 2215, so there’s plenty of time to navigate through the rush-hour traffic, check in and have some supper. Although be warned that as an Italian manned boat, embarkation can be flakey and disorganised at best. That said we did get away on time, although I think we were lucky, having heard other stories. The boat is tired and has no personality, although for 20 hours, if you can get your head down for a good night’s sleep, then a third of your journey will be over by the morning. Our sailing was affected by 500 excitable and un-supervised teenagers running riot until 0100 and not having a working toilet due to a system problem, caused a lot of unnecessary stress. Still a discussion with reception the next morning landed us a free lunch so that was some compensation. You arrive into Civitavecchia around 1815 and depending on where you are parked, you will be off the boat within 45 minutes. Again a bit of a free-for-all, although with no passport control you are through the port in no time at all. So from here, where to next? If you’ve not visited Rome before, then this is a must. It’s a beautiful city with an abundance of ancestry and religion to whet your whistle. Having already ‘done’ Rome, we decided to get out into the country and I had earmarked Bracciano Lake, just under an hour away, east of the city. 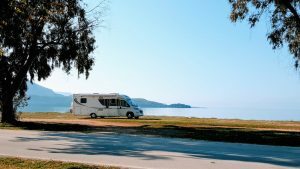 There are a lot of camping options along the lake, a number of which are ACSI sites, although we had our eye on Blue Lake Camperstop in Trevignano Romano. ( Co-ordinates N42° 9.522′ E12° 13.441’) This is a super site for €15 per night, out of season with hook up and only has 28 pitches. You are right by the lake if you wanted to stop for some RnR, Trevignano is only a mile along the charming promenade full of restaurants, supermarkets and a dominating castle. We decided to skedaddle cross-country to explore the east coast, which was new territory for us. Knowing how bad the Italian roads are, we plumbed for the quickest and shortest route possible. Now sadly this meant motorways, one of which was a toll, although as you’ll see from our route, our 150 miles took us through some stunning mountain scenery, only cost us €27.30, which was cheap at half the price. Within three and half hours we were looking at the sparkling Adriatic Sea with the promise of Greek lands just across the horizon. Now we were in touching distance. Our overnighter was in Petacciato Marina, south of Pescara. 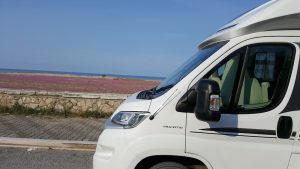 ( Co-ordinates N42° 2.175′ E14° 51.078’ ) It was a dedicated Motorhome Parking area right alongside the beachfront and although there were some suspicious looking car manoeuvres that had me on edge, we actually had an uneventful night. There is a railway not far although there are no trains at night and the views of the beach are to die for. Oh and it was free, out of season. €3 during season when the Office at the end of the road is open. 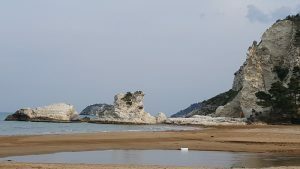 There are no services, although for the night, that is ok.
From here we fancied exploring the peninsular that is home to the Gargano National Park, partly because on the map it is full of green – we like green. It was a bizarre journey because our destination for the night – Vieste was only 88 miles, although with a stop for lunch and a bit of shopping took over four hours. Although you’ll understand why if you do the route. There are more twists and turns in this road than Shirley Temple’s locks. Hugging the coast, then up into the mountains, you weave around the peninsular being treated to some stunning scenery. It is totally worth the trip. Be warned that out of season, i.e. before Easter, not many of the campsites are open and in fact, throughout the whole journey we only saw two with welcome signs outside. And there really are no wild camping opportunities around here. Even the Apps indicate Sostas were open, when in reality they are not. We found our welcome haven just the other side of Vieste – Camping Adriatico ( Co-ordins N41° 51.547′ E16° 10.453’ ) and for €16, paid in cash, we stopped a while to rest our travel weary souls. The rest of the journey around the peninsular is wonderful, if not a bit hairy with full concentration needed. Still it is a stunning part of the country and in fact we would go as far as to say that it is one of the better regions of Italy, especially the southern region. In fact we are really drawn to the south-eastern region and will definitely return. Our route then took us to Matera and Alberobello. Matera is an iconic cave-dwelling town that has built up around a limestone gorge, carved by the river and perched on the cliff face. This stunning place is full of rock chapels and houses that show you life before cement and timber. 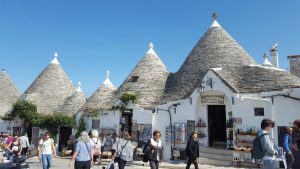 An hour away, Alberobello is one of the most unique places that you’ll ever visit, with a whole section of the ‘old’ village still with their Trulli, (small, dry-stone buildings that are made mortar-free, the roofs of which come off to avoid paying tax). Sounds sensible to me. 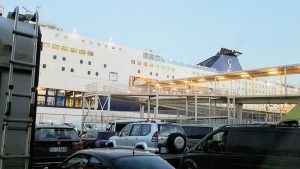 With reluctance, we headed off to Bari for our second ferry within the week, with hopes that this one would be better than the previous week’s debacle. Our second ferry crossing after six days in Italy, sailed from Bari on the south-east coast of Italy. We sailed with Anek Lines and when we arrived at the port, seeing a burnt out ship didn’t give us great expectations. Although we were pleasantly surprised, in fact highly delighted. This firm is terrific. You can sleep on board your camper, which is a bonus and on board the boat, it is just classy. A whole different world than GRIMaldi Lines. One recommendation we would make is, if you want to fill up your fridge/freezer before hitting Greece, don’t do it in Bari. Trying to find and get to one of the supermarkets and then out again was a nightmare and added unnecessary stress to our journey. So shop the day before en route, would be my suggestion. Check-In, however is tricky as there’s no clear signs as to where you get your tickets. The Greece embarkation is right at the end of the Bari Terminal and when you see a large blue building on your right, stop there. This is the check-in. 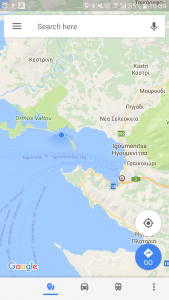 712 02 Heraklion – Crete – Greece. The best tip for 2018 is to book before 28 February for an extra big ‘early bird’ discount. I would highly recommend using them to secure every discount you can, given that the prices are quite high. So with our discounts, our trip from Bari to Igoumenitsa cost us €237.50, given our 7.5m van. (They charge by the metre of your vehicle). The sailing is 9 hours, leaving at 1930pm arriving in Greece at 0530 the following morning, which don’t forget is another hour ahead than western Europe. It was the easiest disembarkation we’ve ever experienced on any ferry and, living on the Isle of Man for 20 years, we did our fair share. You’re off in 15 minutes and out of the port, check-free and ready to hit the road. There are two petrol stations just five minutes out of the port and they are open. They also sell LPG there too. The prices are marginally cheaper than Italy, at €1.32 – April 2017. So ready to hit the road? Perhaps not, given the time of the morning, so if you want to just place your head down for some extra ZZZs and ground yourself in this beautiful country, then head over to Drepano, which is 15 minutes north of Igoumenitsa. It’s on a road that separates a lagoon from the bay, so you have flamingoes one side, the sea the other and you can camp up right on the beach. Although there are signs saying NO CAMPING, out of season when the ACSI site just on the corner is not open, camping seems to be tolerated. Well at least there were four of us when we arrived first thing in the morning. (Co-ordinates; 39.515513 20.212752) It’s such a beautiful place to start your Greek adventure and it’s great to watch the ferries move in and out. For a full break down of sailing options and the different ferry companies available, this is a good website, you can then make plans in the best way to suit your budget and your timescales. We wish you happy Greece adventures and safe travels wherever you are.